I’ve had this book sitting on my bulging craft book shelves for a while. For some reason I’ve never made anything from it. Well this week that all changes. 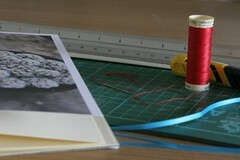 As usual, I used supplies I already had to hand to make this book. I used sketchbook paper for the cover (ideally the cover should be a slightly heavier paper like watercolour but I’m making do) and beautiful pages from old Toast catalogues for the decoration and the facing pages. Bright red thread binds it all together. 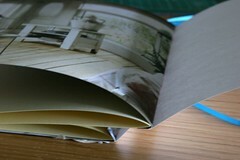 The book has two sections and a ‘W’ fold and was very very easy to make. I have a feeling I will make lots more of these in all shapes and sizes. 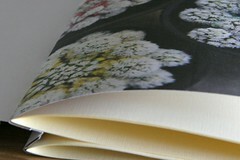 Have you tried book binding – what styles have you tried? i’ve tried creating a concertina booklet. your’s looks like a different yet interesting method. will you be posting a tutorial? 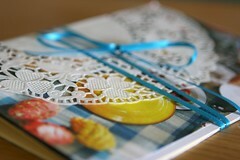 maybe i can do up a tutorial on how to put together a concertina booklet too!